The exponents in the prime factorization are 3 and 1. Adding one to each and multiplying we get (3 + 1)(1 + 1) = 4 x 2 = 8. Therefore 24 has exactly 8 factors. Taking the factor pair with the largest square number factor, we get √24 = (√4)(√6) = 2√6 ≈ 4.898979. There are 4 counting numbers less than √24. Did you notice that all 4 of those numbers less than √24 are in 24’s factor pairs? Stetson.edu informs us that 24 is the LARGEST number that can make that claim. Another fact: 4! = 1 × 2 × 3 × 4 = 24. But that’s not all! 24 is a repdigit palindrome in 4 bases! 44 BASE 5 because 4(5) + 4(1) = 24. 33 BASE 7 because 3(7) + 3(1) = 24. 22 BASE 11 because 2(11) + 2(1) = 24. 11 BASE 23 because 1(23) + 1(1) = 24. 24 is also the sum of consecutive prime numbers: 11 + 13 = 24. 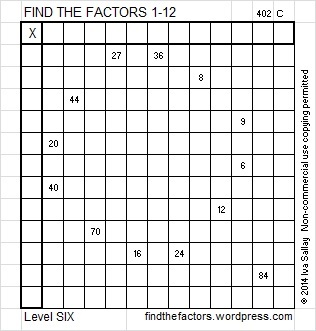 When 24 is a clue in the FIND THE FACTORS 1-10 Puzzles, the factors will be either 3 × 8 or 4 × 6. 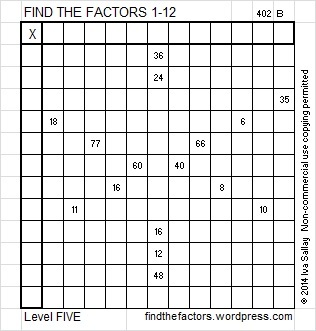 When 24 is a clue in the FIND THE FACTORS 1 -12 puzzles, the factors could be 2 × 12, 3 × 8, or 4 × 6. In each case, only one set of factors will be used for each clue in any particular puzzle. It’s January, and some of us are a little tired of the snow while others are longing to hit the ski slopes. I’m writing today to suggest a few ways to deal with snow when it seems like more of an obstacle than an opportunity. I walked into a second-grade classroom last week and saw books and books about snow, snowflakes, snowmen, etc. Celebrating winter is one way to deal with the snow. Here are a few snow problems for you to solve while you review multiplication facts: I’ve created a nightmare of a snowstorm with huge snowflakes and snowballs and only an itsy bitsy snow shovel to deal with it all. Be grateful this isn’t what you are really facing! How do you solve one of these snow-related puzzles? Write the numbers 1 – 12 in the top row and again in the first column so that those numbers are the factors of the given clues. Each puzzle has only one solution. Click here for some tips to help you solve the puzzles. Click 12 Factors 2014-01-13 for printable versions of these and a couple other puzzles as well as last week’s answers. Puzzles are fun, but they can’t help you get the car out of the garage after a snowstorm. If you wake up to find just under a foot of snow (or even much more) on your driveway (or your roof), a good snow shovel can still be the answer. I recommend a shovel with a crooked handle. It makes lifting snow so much easier. This excellent article has everything you need to know to shovel snow. Two places I have lived face winter storms on occasion. Those places were Oklahoma County, Oklahoma and Salt Lake County, Utah. It didn’t snow very often when we lived near Oklahoma City, but when it did, a crooked-handled shovel allowed me to clear my driveway faster than any of my neighbors who had only a straight-handled shovel. Freezing rain, thunderstorms, and tornadoes were a much bigger concern in Oklahoma than snow. Compared to Oklahoma, we get much more snow near Salt Lake City where we have lived for the last 20 years. Now my family has two of these crooked handled shovels. For seventeen years we relied solely on those shovels. We found that shoveling was good exercise, but it also took too much time, and time seems to be getting in shorter supply. Three years ago we bought a good quality snow blower, and it is definitely a time saver. If you buy a snow blower, make sure it is a model that allows the operator to change the direction where the snow is blown. Also if the snowblower gets clogged with snow, always turn it off before attempting to unclog it. We have a friend who lost a finger because he didn’t turn it off first. We also know people who own tractor snowplows. They easily clear their driveways and sometimes the sidewalks for their entire block. There is a snowplow on the Sears website. The blade on it is currently for sale for just under $250.00. Ouch. We dream of someday getting an automatic snowmelt system that will turn itself on and melt any snow that falls on our driveway. One such system is described here. My daughter-in-law endured the polar vortex that hit the Eastern half of the United States last week. She wrote, “Public service announcement: 37+ weeks pregnant with a head cold and two small sick kids is no fun. I do not recommend it. Today I am grateful for PBS kid shows, giant boxes of tissues, soft blankets, and easy slow cooker meals.” She also survived by finding humor in the situation. She shared a hilarious Sunny Street cartoon panel featuring a very cold pregnant woman whose water broke and turned immediately into ice cubes. I am absolutely amazed at how much more snow the Northern Hemisphere gets compared to the Southern Hemisphere during their respective winters. So as a last resort, maybe it is time to move. I like this animation showing where it snows on earth each month of the year. If you stay where you are, you may take comfort in knowing there are places that have much more snow. Check out the Top 12 Biggest Snowfall Events in Recorded History! I am in need of the snow cartoon that you posted! Also, loved your Valentine’s Day post with the dates and square roots of Valentines day and St Patricks day. I am enjoying your work here. Thank you. That means a lot coming from a true artist such as yourself. I am in awe of the beautiful images you have created celebrating pi on your bookbinding blog. You certainly have been pounded by snow lately. I hope you get to enjoy some sunshine soon, too.